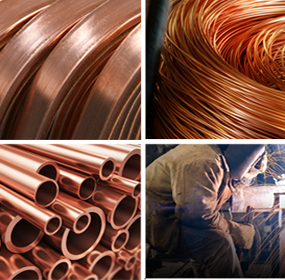 Bhagyanagar India Ltd. is one of the largest copper manufacturers in India. The principle business of our company is dealing with copper foil, wire, sheet, bus bar and rod manufacturing. Being the pioneers of copper wire manufacturing we are working in exceeding the scope of customer satisfaction. We are the leading copper manufacturers in our domain and have always been the first choice of other industries when it comes to copper manufacturing in India, UAE, Indonesia and the United States. We have perfected copper rod manufacturing techniques and have set industrial benchmarks. We are known as the most preferred copper foil manufacturers in india. For years we have been addressed as the leading copper sheet manufacturer in india. Other copper wire manufacturers have always looked up to us as trendsetters in engineering. We have major clients all across the world and have fulfilled all their needs regarding our manufacturing techniques and helpful client servicing. Bhagyanagar India Ltd. (BIL) is committed to creating value for all its stakeholders - customers, employees, investors, partners, vendors and the community. At BIL we believe and invest in building long lasting relationships with customers and partners. Bhagyanagar India announced that the Board of Directors of the Company at its meeting held on 12 October 2015, inter alia, has finalised and approved the proposal for demerger of Solar Business to Surana Telecom and Power and Real Estate Business to Bhagyanagar Properties in terms of the Scheme of Arrangement pursuant to the provisions of the Companies Act, 1956 / 2013 (`the Scheme`). Bhagyanagar India announced that on effectiveness of the scheme of arrangement, the existing shareholders of Bhagyanagar India for every 6 (six) equity shares will continue to hold 3 (three) equity shares of Rs. 2/- each of Bhagyanagar India and will get 4 (four) equity shares of Re. 1/- each of Surana Telecom and Power and 3 (three) equity shares of Rs. 2/- each of Bhagyanagar Properties. As part of the scheme of arrangement, the existing paid up share capital of Bhagyanagar India is proposed to be reduced to 50% of 6,39,90,000 equity shares of Rs. 2/- each (i.e., 3,19,95,000 equity shares of Rs. 2/- each), without affecting overall holding levels of Promoters and Public. Bhagyanagar India announced that the Board of Directors of the Company at its meeting held on 30 May 2015, inter alia, have recommended the final dividend of Rs 0.3 per equity Share (i.e. 15%) , subject to the approval of the shareholders. Mrs. Madhumathi Suresh has been appointed as Additional Director (under the category of Independent Woman Director) of the Company w.e.f. 23rd March, 2015. She is a Fellow member of ICAI and Practicing as Chartered Account for past 21 years.